Review: The HP Pavilion dv7-6c54ea is a 17.3" screen laptop, featuring the Intel Core i5-2450M Processor running at 2.5GHz, 6GB RAM, an AMD Radeon HD 7470M graphics card as well as a generous 1TB Hard drive, all for around £600 mark. Measuring 3.6cm in depth, 41.6m in width, and 27.5cm in width, this notebook is small enough to commute with, but still features a full size keyboard complete with numberpad, making this notebook highly practical. The sleek metal exterior gives it an expensive appearance, whilst the interior also features a beautiful brushed metal finish, which should eliminate fingerprint marks, and help this notebook maintain it's good looks. With a claimed 5 hour battery life, this laptop will be highly suitable for use on the move - read on for our dv7-6c54ea review. 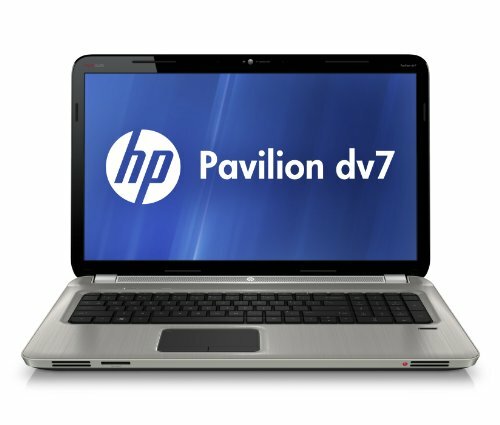 Below is our review of the HP Pavilion dv7-6c54ea, a 17.3" laptop, featuring 6GB RAM, 1TB hard drive and Windows 7 Home Premium. The exterior of the HP Pavilion dv7-6c54ea is finished in a stunning brushed aluminium metal casing, which both feels solid and looks great, as well as being practical - helping to prevent fingerprint marks. It shouldn't look dated as fast as many of it's competitor's - whilst it doesn't stand out like some of the offerings from Sony, it's classic looks should age well. Clean lines and rounded corners give this HP notebook a slim and designer look - our testers found it to be aesthetically pleasing overall. It is a touch on the heavy side at around 3.43kg, which may put off commuters and those who plan on travelling regularly - however this is the case for most larger screen notebooks in our experience - increased screen sized almost always has a increased weight comprise. Upon opening the notebook, you'll find a full width black keyboard, surrounded by the same brushed metal finish. The keyboard itself is slightly sunken into the body of the notebook, to prevent it from coming into contact with the 17.3" screen upon closing. The black keys are of a reasonable size, and feel of a decent quality, as you'd expect at this price range. Situated to the right of the standard letter keys is a full size number pad, which should come in handy for spreadsheet users, accountants and anyone else who requires regular numerical input. The trackpad offers good control, and is situated in line with the centre of the keyboard, slightly to the left hand side of the actual notebook body. The two buttons felt comfortable to use - overall we did not note any real issues with the controls during testing. Another notable feature of this notebook is the fingerprint recognition technology for security purposes, which worked well during our test period. No complaints here whatsoever. A great deal of thought has been put into the speaker system of this notebook - featuring no less than four separate speakers instead of the usual pair found on the majority of laptops. Two are situated at the read of the laptop, and the other pair are located at the front - this helps to give decent sound quality and an even listening experience regardless of your position in relation to the notebook, or even the surface on which it is resting - no more muffled sounds if lying on your bed or sofa. Overall sound quality was pretty good, and on par with the better audio systems we've experienced in laptops. The display, as mentioned before, is 17.3" in size, and is surrounded by a thin polished black bevel, which contrasts nicely with the rest of the brushed metal finish. It produces a sharp picture, with vivid colours, in it's standard resolution of 1600 x 900 pixels, enabling you to fit more on your screen at any one time, thus making it suitable for multitasking. In terms of connectivity, you are supplied with four different USB ports, 1 Ethernet port, 1 HDMI port, 1 VGA output, as well as the standard headphone and microphone jacks. The 1TB SATA hard drive is obviously fairly spacious - although it is a little disappointing that it runs at 5400RPM instead of the faster access rate of 7200RPM that you may expect at this price range. In terms of storage it is very generous, and you should have ample room for all of your file, music, software and photos - it ran pretty quickly, and we had no real issues here. As a bonus, HP have included their imaginatively named "ProtectSmart’s accelerometer" - essentially this is designed to protect your hard drive and it's data in the event of dropping your notebook. Needless to say we haven't tested this feature, so no idea on how effective this is, however it's reassuring to know thought has been put into this area. The 6GB RAM and Intel Core i5-2450M 2.5GHz Processor kept applications running fast - we opened multiple tabs in our web browser, as well as several memory and graphically intensive applications simultaneously without any noticeable effects to the overall speed or performance of this notebook. In short, it will ideal for most users, and is suitable for all but the most graphically intensive of applications. Operating system duties are provided by the stable Windows 7 Home Premium - as per the rest of our reviews we don't usually go into detail on this aspect, simply as it is the standard operating system for virtually all notebooks in or around this price range, with the obvious exception of Apple. So who is this laptop aimed at? It features a pretty stylish exterior, as well as a decent specification. The sound quality is excellent, as is the display, and the controls were also pretty good. If we have to be picky then we'd be critical of the hard drive speed, even though it does offer a generous amount of room. it is also slightly on the heavy side at 3.43kg - if you're a regular traveller this may exclude this laptop for you. Pros: Decent sound, 17.3" screen, looks great, feels solid, fast performance, room for expansion/upgrades. Cons: Included hard drive is only 5400RPM, weighs 3.43kg, so maybe not ideal for travel. All in all, the HP Pavilion dv7-6c54ea would be a great purchase as a laptop for regular use at work or home - the increase in weight may not make it ideal for those who regularly travel, but for the average user, the fast performance and large hard drive of this notebook will make this a contender for those looking to spend under £600 on a laptop. Extras: AMD Radeon HD 7470M graphics card, webcam and finger print technology.